Here's another amazing story in an honor of those dedicated to helping animals in need. 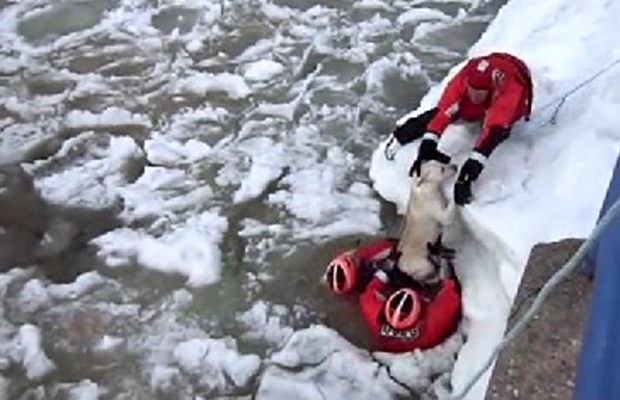 On Monday, February 2nd, the crew from Coast Guard were fighting with the icy water and chunks of ice in a chillingly low temperature to save the dog from drowning in Michigan's Frankfort Channel. The poor pet fell into the Channel and couldn't get out, then got trapped between huge chunks of ice which could've mean the end of the dog's life. According to the reports from US Coast Guard, an officer swam about 150 years just to reach the drowning dog and after grabbing the dog, he swam back so that his team can help and pull the pooch out of the water and into the safety. Watch this amazing, heartwarming video of the dog being saved above.